داروی پیریدوستیگمین بروماید یک عامل جلوگیری کننده از فعّالیّت آنزیم استیل کولین استراز به صورت برگشت­پذیر است که در پیش­گیری از مسمومیّت با سمّ سومان (نوعی سلاح شیمیایی) کاربرد دارد. درین پژوهش، سعی شد با استفاده­از محلول حساس به دمای کیتوسان/گلیسرول فسفات، یک سامانه­ی آهسته­ی رهش با قابلیت تزریق برای این دارو تهیه شود. ابتدا حساسیت دمایی و خواص رئولوژیکی محلول 2% وزنی/حجمی کیتوسان در محلول 1/0 مولار اسیدکلریدریک و درصدهای مختلف نمک گلیسرول فسفات مورد مطالعه قرار گرفت. درنهایت، رهایش داروی پیریدوستیگمین بروماید ازین سامانه­ی حساس به دمای قابل تزریق بررسی شد. نتایج حاصل نشان داد که افزایش میزان نمک گلیسرول فسفات در محلول کیتوسان موجب افزایش آهسته­یpH ، کاهش زمان ژل شدن محلول، کاهش مدول الاستیک و استحکام ژل می­شود. اثر غلظت نمک گلیسرول فسفات بر رفتار برگشـت­پذیری ژل نیز بررسی و مشخص شد که در غلظت­های بالا از گلیسرول فسفات، ژل­های حاصل غیر برگشت­پذیر است. درمقابل، با کاهش غلظت نمک فسفاتی، خاصیّت برگشت­پذیری مشاهده شد. مطالعه­های رهایش دارو نشان داد که هیدروژل حاوی w/v 2% کیتوسان و w/v16% نمک گلیسرول فسفات می­تواند رهایش آهسته­ی دارو را برای یک دوره­ی 4 روزه فراهم نماید. هم­چنین سازوکار غالب در فرایند رهایش دارو ازین هیدروژل، سازوکار نفوذ فیکی است. Somanis one of the strongest nerve agents and treatment of poisoning with Soman is difficult and time-critical. Pyridostigmine bromide is an inhibitor of cholinesterase used for protecting against toxicity by Soman. In this study, a new injectable thermosensitive sustained release dosage form of pyridostigmine bromide was achieved by chitosan/glycerolphosphate solution. In this study, thermosensitivity and rheological properties of chitosan solution (2% w/v) in aqueous hydrochloric acid (0.1 molar) with different percent of glycerolphosphate salt as well as the release profile of pyridostigmine bromide have been investigated. It was observed that increasing the glycerolphosphate salt concentration would increase the pH of chitosan solution, while decrease its gelation time and loss or storage modulus. It was also observed that glycerolphosphate salt concentration has direct effect on hydrogel thermoreversibility. The presented results indicated that hydrogel containing 2% w/v of chitosan and 16% w/v of glycerolphosphate salt could sustain the delivery of pyridostigmine bromide, through Fickian diffusion, up to four days. J. P. Sieb, W. KÖhler, “Benefits from Sustained-release Pyridostigmine Bromide in Myasthenia Gravis: Results of a Prospective Multicenter Open-label Trial” Clin Neurol Neurosurg 112, 781–784, 2010. R. A. Maselli, J. D. Henderson, J.Ng, D. Follette, G. Graves, B. W. Wilson, “Protection of Human Muscle Acetylcholinesterase from Soman by Pyridostigmine Bromide” Muscle Nerve 43, 591–595, 2011. Q. Y. Tan, M. L. Xu, J. Y. Wu, H. F. Yin, J. Q. Zhang, “Preparation and Characterization of Poly (lactic acid) Nanoparticles for Sustained Release of Pyridostigmine Bromide” Pharmazie 67 (4), 311-8, 2012. N. Hegazy, M. Demirel, Y. Yazan, “Preparation and in vitro evaluation of pyridostigmine bromide microparticles” Int J Pharm 242, 171–174, 2002. Y. Huang, T. Tsai, C. Cheng, T. Cham, “Formulation Design of a Highly Hygroscopic Drug (Pyridostigmine Bromide) for its Hygroscopic Character Improvement and Investigation of In vitro/In vivo Dissolution Properties” Drug Dev Ind Pharm 33, 403–416, 2007. N. Bolourchian, M. Rangchian, M. Foroutan, “Prolonged Release Matrix Tablet of Pyridostigmine Bromide: Formulation and Optimization Using Statistical Methods” Pak J Pharm Sci 25, 607-616, 2012. Q. Tan, R. Jiang, M. Xu, G. Liu, S. Li, J. Zhang, “Nanosized sustained-release pyridostigmine bromide microcapsules: process optimization and evaluation, of characteristics” Int J Nanomed 8, 737-745, 2013. S. Bagheri-Khoulenjani, H. Mirzadeh, M. Etrati-Khosroshahi, “Chitosan and Nanohydroxyapatite Roles in Physical and Chemical Characteristics of Gelatin/Chitosan/Nanohydroxyapatite Microspheres” Iran J Polym Sci Technol 23 (6), 487-498, 2011. S. Bagheri-Khoulenjani, S. M. Taghizadeh, H. Mirzadeh, “An Investigation on the Short-Term biodegradability of Chitosan with Various Moleculare Weight and Degree of Deacetylation” Carbohyd Polym 78, 773-778, 2009. L. Y. Jiang, Y. B. Li, X. J. Wang, L. Zhang, J. Q. Wen, M. Gong, “Preparation and Properties of Nano-hydroxy apatite/Chitosan/Carboxymethyl Cellulose Composite Scafoold” Carbohyd Polym 74, 680-684, 2008. F. Naimian, F. Khoylo, R. Beteshobabrud, “The Role of Solvent on Radiation Degradation and Antibacterial Activity of Chitosan Against Pectobacterium Carotovorum” Iran J Polym Sci Technol 23 (4), 305-310, 2010. H. Mirzadeh, F. Hormozi, M. A. Mohagheghi, N. Yaghobi, S. Amanpour, H. Ahmadi, “Preparation of Chitosan Derived from Shrimps Shell of Persian Gulf as a Blood Hemostasis Agent” Iran Polym J 11, 63-68, 2002. S. M. Taghizadeh, G. Davari, “Study on Mucoadhesion Properties of Xhitosan” Iran J Polym Sci Technol 20, 515-519, 2007. Y. Mohamadi, H. Mirzadeh, F. Moztarzadeh, M. Soleimani, E. Jabbari, “Osteogenic Differentiation of Mesenchymal Stem Cells on Novel Three-Dimentional Poly (L-Lactic Acid) / Chitosan / Gelatin/Beta-Tricalcium Phosphate Hybrid Scaffolds” Iran Polym J 16, 57-69, 2007. 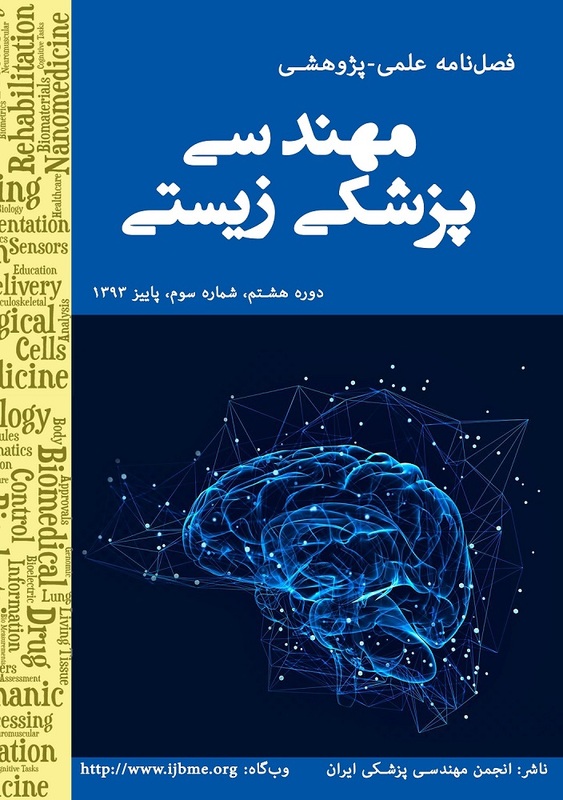 F. Afshar-Taromi, F.. Nayeb-Habib, S. Salahshoor-Kordestani, Z. Shariatinia, “A Novel Topical Biocompatible Tissue Adhesive Based on Chitosan-modified Urethane Pre-polymer” Iran Polym J 20 (8), 671-680, 2011. H.Yang, S. Hua, W. Wang, A. Wang, “Composite Hydrogel Beads Based on Chitosan and Laponite: Preparation, Swelling, and Drug Release Behaviour” Iran Polym J 20 (6), 479-490, 2011. F. Ganji, M. J. Abdekhodaie, A. Ramazany, “Gelation Time and Degradation Rate of Chitosan as a Thermosensitive Injectable Hydrogel” J Sol-Gel Sci Technol 42, 47-53, 2007. J. Wu, W. Wei, L. Wang, Z. Su, G. Ma, “A Thermosensitive Hydrogel Based on Quaternized Chitosan and Poly (ethylene glycol) for Nasal Drug Delivery System” Biomaterials 28, 2220–2232, 2007. E. Khodaverdi, M. Tafaghodi, F. Ganji, K. Abnoos, H. Naghizadeh, “In Vitro Insulin Release from Thermosensitive Chitosan Hydrogel” AAPS Pharm Sci Tech 13 (2), 460-466, 2012. H. Y. Zhou, Y. P. Zhang, W. F. Zhang, X. G. Chen, “Biocompatibility and Characteristics of Injectable Chitosan-based Thermosensitive Hydrogel for Drug Delivery” Carbohyd Polym 83 (4), 1643-1651, 2011. A. Chenite, C. Chaput, D. Wang, C. Combes, M. Buschmann, C. Hoemann, J. Leroux, B. Atkinson, F. Binette, A. Selmani, “Novel Injectable Neutral Solutions of Chitosan form Biodegradable Gels In Situ” Biomaterials 21, 2155–2161, 2000. A. Chenite, C. Chaput, C. H. Combes, A. Selmani, F. Jalal, “Temperature-controlled pH-Dependent Formation of Ionic Polysaccharide Gels” US Patent 6, 344, 488, 2002. M. Berradaa, A. Serreqia, F. Dabbarha, A. Owusub, A. Guptaa, S. Lehnert, “A Novel Non-toxic Camptothecin Formulation for Cancer Chemotherapy” Biomaterials 26, 2115–2120, 2005. S. Kempe, H. Metz, M. Bastrop, A. Hvilsom, R. Contri, R. Mäder, “Characterization of Thermosensitive Chitosan-based Hydrogels by Rheology and Electron Paramagnetic Resonance Spectroscopy” Eur J Pharm Biopharm 68, 26–33, 2008. J. Wu, Z. G. Su, G. H. Ma, “A Thermo- and pH-sensitive Hydrogel Composed of Quaternized Chitosan/glycerophosphate” Int J Pharm 315, 1-11, 2006. K. E. Crompton, R,J. Prankerd, D. M. Paganin, T. F. Scott, M, K. Horne, D. I. Finkelstein, K. A. Gross, J. S. Forsythe, “Morphology and gelation of thermosensitive chitosan hydrogels’ Biophysic Chemist 117, 47–53, 2005. E. Ruel-Garie´py, A. Chenite, C. Chaput, S. Guirguis, J. C. Leroux, “Characterization of thermosensitive chitosan gels for the sustained delivery of drugs” Int J Pharm 203, 89–98, 2000. J. Yan, L. Yang, G. Wang, Y. Xiao, B. Zhang, N. Qi, “Biocompatibility Evaluation of Chitosan-based Injectable Hydrogels for the Culturing Mice Mesenchymal Stem Cells In Vitro” J Biomater Appl 24, 625-637, 2010. A. Chenite, M. Buschmann, D. Wang, C. Chaput, N. Kandani, “Rheological characterization of thermogelling chitosan / glycerol-phosphate solutions” Carbohyd Polym 46, 39-47, 2001. G. Arora, K. Malik, I. Singh, S. Arora, V. Rana, “Formulation and evaluation of controlled release matrix mucoadhesive tablets of domperidone using Salvia plebeian gum” J Adv Pharm Technol Res 2 (3), 163–169, 2011.